In September 1947, Capt. Edward E. Paré, then in command of the Atlantic Fleet's ServRon 2, delivered a comprehensive lecture at the Naval War College in Newport, Rhode Island, on the topic of mobile fleet support. Paré, as will be recalled from chapter 8, had been the first officer in the U.S. Navy to command an oiling group at sea. He had served with the Fifth Fleet during the conquest of the Marshalls, the Marianas, and Iwo Jima, first under Comdr. August H. Gray as chief of staff for ServRon 8 and later under Rear Adm. Donald B. Beary as his aide and chief of staff for the newly formed ServRon 6.1 Not only was Captain Paré the navy's leading authority on replenishment at sea, but he was also its leading proponent. In his speech to the Naval War College, Paré introduced a new concept: the one-stop replenishment ship. Although the idea of maintaining a task force at sea via underway replenishment had first surfaced during the last months of the war in the Pacific, its development had been hampered by the need to adapt a number of conventional supply ships for this role. By war's end, the job of rearming and supplying carrier groups at sea had become an immense undertaking that required an entire squadron of support ships composed of oilers, ammunition types, stores ships, and provision ships. To maintain combat readiness, each combatant had to come alongside a succession of ships--each capable of dispensing only one type of cargo--in order to take on the proper amount of fuel, ordnance, food, and stores needed to maintain combat readiness. The problem was most acute for the carriers that had to make up to four stops during the course of a single replenishment day. As Paré pointed out in his lecture, much of the short time allocated for replenishment was wasted in the multiple approach, rigging, and breakaway times necessitated by the use of so many different ship types. "If one large ship could carry fuel, food, ammunition, and some stores, and could be so rigged as to pass rapidly all kinds of material," then a great deal of time could be saved. Depth 43' 6" 40' 5"
SOURCE: "Mobile Logistic Support," Lecture by Capt. E. E. Paré, NWC, 16 September 1947. 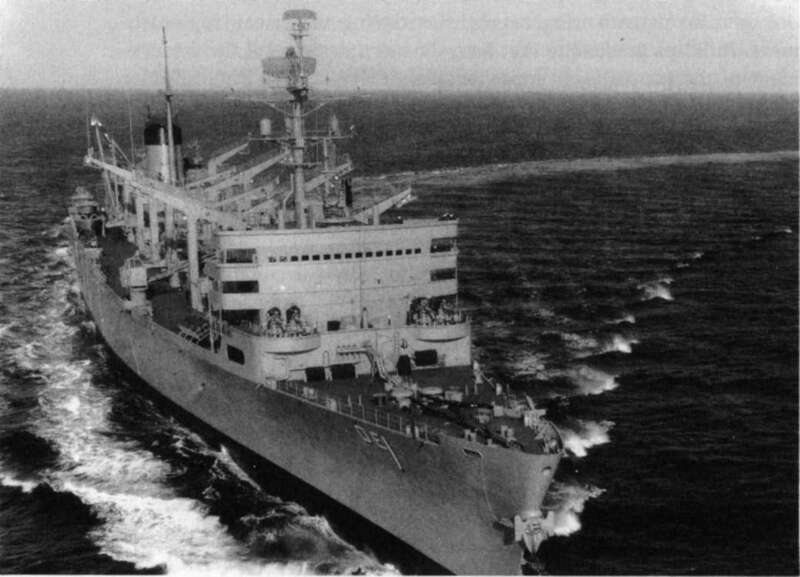 Admiral Burke responded to the bureau's request in July 1957 with a call to broaden the scope of the conference so as to cover the entire subject of mobile logistic support.11 Although he recognized the need to provide combat logistic support afloat, it was becoming increasingly clear that it would be necessary to reduce the expenditures for support ships if adequate numbers of modern combatants were to be procured in the coming years. How to achieve this dichotomy in an era of increasing costs and limited budgets was one of the objectives that Admiral Burke hoped the conference would address. Several weeks before the conference was scheduled to take place, he asked each of the various fleet commanders to prepare a fifty-minute presentation defining the future requirements for mobile logistic support needed by their respective commands in the 1965-75 time period. We do not want new and faster UNREP ships that have the same equipment and cumbersome transfer methods as our present UNREP ship. We need faster means and reduced time with fewer preliminaries and we must be able to UNREP in all weather. Rear Adm. E. A. Solomons; and Rear Adm. I. H. Nunn, the commander of the Atlantic Fleet. The remarks of these important leaders, recalled here by Marvin Miller, provide invaluable insight into the problems then occurring at sea and the attitudes within the fleet toward their solution. The first speaker, Admiral Pirie, talked about the recently completed Second Fleet NATO exercises off the coast of Norway. Weather conditions were so severe that his destroyers could not hold station alongside fleet oilers (AO-22 class and AO-143 class) because the oilers were yawing so severely. The only platform stable enough to fuel his destroyers was the task force's lone battleship. Admiral Pirie also explained that British submarines playing the part of the Soviets, stayed under the Underway Replenishment Group (URG) and just waited for the combatant ships to rendezvous for replenishment. In the future, he concluded, the carriers would have to stay in the center of the task force for protection and not break away, as was current doctrine. Rear Admiral Solomons flatly condemned the navy's newest UNREP ships as inadequate and "just new versions of World War II jury-rigged merchant ships." He stated that it took ten hours every three days to replenish aircraft carriers and that this was unacceptable. Rear Admiral Nunn stated that we had gotten nowhere since the end of World War II and called for a technological breakthrough in transfer rates at sea. As an unacceptable example, he cited his own experience with the guided missile cruiser Boston (CAG-1), which, during a recent exercise at sea, required eleven hours to rearm. would be able to transfer ammunition and stores to the ships alongside while fuel was being pumped through the hoses connected to the receiving ship. Although there was a great deal of concern about how transferring of aviation fuel and ammunition would be handled simultaneously, there was little open criticism of the basic concept during the conference, perhaps because it had been blessed by Admiral Burke. Unlike other replenishment types, the fast combat-support ship was designed to operate with the strike force and not as a unit of the Underway Replenishment Group, which had been tasked under existing doctrine to provide logistics at sea. The fast, multiproduct replenishment ship would travel with an aircraft carrier task force and was designed to replenish combatant ships whenever needed and whenever operations and weather conditions permitted. To fulfill this mission required a much larger and more powerful ship than the Neosho-Cass oilers, which had just entered service. enhance its maneuvering capabilities during underway replenishment. BuShips made sure that both the stern design and the arrangement of the propellers were extensively tested in the David Taylor Model Basin before finalizing the design.17 As in the layout proposed by Bethlehem, BuShips placed the propulsion machinery aft, but moved the bridge forward for better conning visibility and to provide protection for personnel and machinery at the UNREP delivery stations on the weather deck located between the bridge and the machinery uptakes. In addition, a secondary conning station was installed on the port side aft of the machinery uptake to insure excellent visibility during carrier replenishments, though operational experience proved it to be an unnecessary expense and it was relegated to emergency use in the event of battle damage to the main bridge. From the beginning of the design process, it was understood that the AOE concept would require new methods of delivery if the transfer rates envisioned for the new ship were to be achieved. These required a technological breakthrough to minimize the time combatants spent during underway replenishment, one that could be utilized under any conditions, day or night in fair weather or foul. program for a future system based on a pneumohydraulic ram tensioner. The first tests of the new system were conducted in April 1960 between two light ships in heavy seas. Although successful, Commander Hoof held off approval. He was concerned about the economic impact of the new system, if adopted, since it would require the addition of new hardware--sliding padeyes--on every ship in the navy that had a receiving station. Tight shipbuilding schedules forced shortcuts in the development of the FAST system bypassing many of the activities normally conducted during the research and development phase of any new system. To expedite delivery, commercial-type deck machinery was adapted to suit the performance specifications resulting in the adoption of numerous nonstandard machinery installations on a variety of ships outfitted with the FAST system. At least thirty-four different designs were fitted on twenty-seven ships making routine maintenance a nightmare. The FAST missile transfer system "soon became known in the fleet as the UNREP system that wouldn't work when needed. "24 It was sometimes unsafe and was always extremely expensive to maintain. As originally designed, the Fast Automatic Shuttle Transfer was intended to transfer surface-to-air missiles every ninety seconds in a shock-mitigated environment without being touched by human hands. Late in 1966, the commander, Operational Test and Evaluation Force, advised the CNO that FAST, as then installed, could not be maintained by the fleet.25 Although FAST, when it worked, was extremely effective even at night and in heavy weather, it had to be simplified--a process that would not be completed until the mid-1970s when a master plan was presented for backfitting UNREP ships with navy standard UNREP machinery. The biggest change involved the elimination of the complicated shock mitigation and the automated topside handling equipment. Instead, each missile was placed in a shock-resistant dolly, which had to be moved around on deck by hand. Automated below-deck machinery needed for rearming missile magazines was also eliminated to further reduce the complexity of the system. These changes did not increase the deck-to-deck transfer cycle, but did add significantly to the time needed to manhandle loaded and empty dollies on the receiving ship. This increased the time to rearm missiles from ninety seconds to five minutes, but reduced the complexity of the system by an order of magnitude on combatants and by a factor of at least five on the UNREP ship. Unfortunately the simplified system, called STREAM (Standard Tensioned Replenishment Alongside Method), made deck handling of missiles in heavy weather more hazardous. Nevertheless, the STREAM concept proved to be a highly reliable, easily maintained system. The use of the ram-tensioned highline was also adopted for use on fueling rigs as a means of keeping the supporting span wire at constant tension. Based on a hydropneumatic ram, the system as currently installed automatically compensates for ship motion due to roll, pitch, or yaw allowing the replenishing ships to increase or decrease separation by as much as eighty-one feet. rigid, wire-reinforced hose that had been introduced in the Second World War.